Adelson, Lester 1960. The Coroner of Elsinore. New England Journal of Medicine, Vol. 262, Issue. 5, p. 229. 1Robert, M., 1903, Les empoisonnements criminels au XVI seicle. These de Lyon. 2 For a full discussion of these drugs, see Macht. Johns Hopkins Hospital Bulletin, 1918, xxix, 329, 165–170. 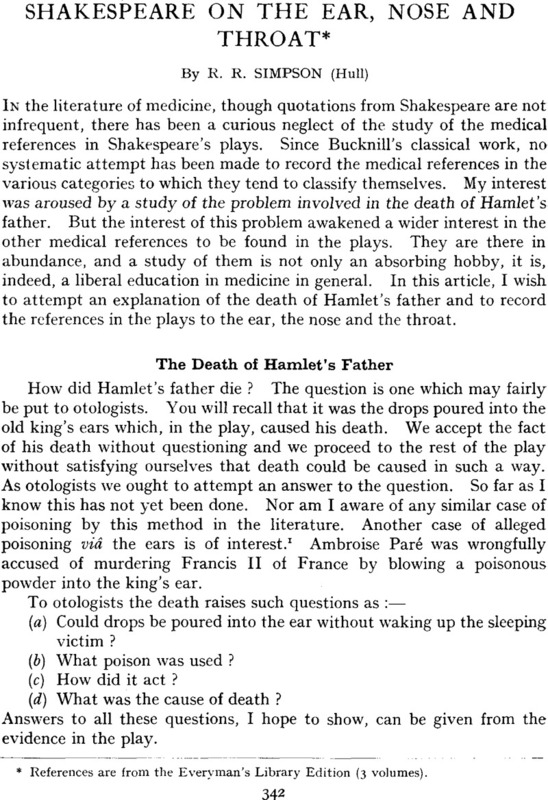 3Gray, Albert A., 1910, The Ear and Its Diseases, 112–3. 4SirStclair, Thomson, 1901, Brit. med. J., i, 957. 5Macht, , 1949, Bulletin of the History of Medicine, 03–04, xxiii, 2.